Five Native Americans were named 2017 Bush Fellows. In total, twenty-four leaders were chosen for their records of achievement and their potential to make significant contributions in Minn., No. Dakota, So. Dakota and 23 Native Nations. Melissa Boyd (Mille Lacs Indian Reservation, MN) will finish her bachelor degree in elementary education, complete a certificate of contemporary indigenous multilingualism at the University of Hawaii and study behavior design through Stanford School of Medicine. Heather Dawn Thompson (Rapid City, SD) will pursue corporate finance training, combining it with a focus on Lakota values of leadership, language and self-sufficiency. 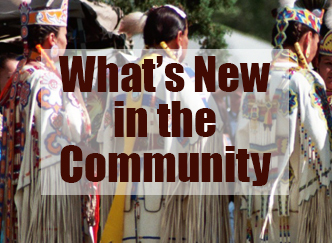 Vaughn Vargas (Rapid City, SD) will develop new methods to recruit and retain Native American police officers. Karina Perkins (Robbinsdale, MN) will build the leadership skills necessary to champion a systemic change to treat addiction with a disease management approach. Tomi Phillips (Fort Yates, ND) will pursue a doctorate degree in educational leadership. The Bush Fellowship provides people with up to $100,000 over 12 to 24 months to pursue learning experiences that help them develop leadership skills and attributes. For more info, see: www.bushfoundation.org/fellowships/bush-fellowship. The Loft Literary Center announced the winners of the 2017 McKnight Artist Fellowships for Writers, Loft Awards in Creative Prose and Loft Award in Children’s Literature. Heid E. Erdrich (Turtle Mountain Ojibwe) was one of the recipients of the creative prose writers’ award. Erdrich is the author of the memoir-in-recipes Original Local, which tells indigenous foods stories from her family and from tribes in the Upper Midwest. An interdisciplinary artist, she regularly publishes nonfiction essays and collaborates to create performances and poem films as well as prose on visual artists. Erdrich has authored five collections of poetry. She is working on a book of short prose and cross-genre writing on race, art, and Native Nations. The McKnight Artist Fellowships for Writers provide Minnesota writers of demonstrated ability with an opportunity to work on their writing for a concentrated period of time. For more info, see: www.mcknight.org/grant-programs/arts/artist-fellowships. Louise Erdrich has won the 2017 National Book Critics Circle Award in fiction for her 15th novel, “LaRose,”. This is the second time the Minneapolis author has won the NBCC award. Her debut novel, “Love Medicine,” won in 1984. Eleven grants were awarded to Native American individuals in Minnesota through Tiwahe Foundation’s American Indian Family Empowerment Program Fund (AIFEP) from its January grant round. In the Economic Self-Sufficiency category: David Bernie’s grant will help him take his Indigemojis into the Android market (see cover story). And Benjamin Spears’ (Red Lake Ojibwe) grant will assist in upgrading business equipment for Spears Tree Care of Bloomington. In the Educational Achievement category: Brittany Austin (Standing Rock Sioux) will pursue an associate’s degree in Education at Minneapolis Community and Technical College; Jolene Chestnut (White Earth Ojibwe) is pursuing a Master of Tribal Administration and Governance at the University of Minnesota-Duluth; Akikwe Cornell (Sault Sainte Marie) is completing a doctorate in American Studies at the University of Minnesota; Honor Lamont (Oglala Lakota) will pursue an associate’s degree in Human Services at Minneapolis Community and Technical College; Amber Leger (Leech Lake Ojibwe) is pursuing an associate’s degree in Business Management at Minneapolis Community and Technical College; Anne O’Keefe-Jackson (Lower Sioux) is pursuing a master’s degree in Business Administration at Augsburg College; Jason Poitra (Turtle Mountain Ojibwe) will pursue a welding certificate at Dunwoody College of Technology; Samora Redding (White Earth Ojibwe) is pursuing an associate’s degree in Human Services at Minneapolis Community and Technical College; and Sasina Samreth (White Earth Ojibwe) is pursuing a certificate in Accounting at Minneapolis Community and Technical College. More info can be found at: //tiwahefoundation.org/aifep-fund.